It is blowing and raining cats and dogs outside this Sunday morning and I feel like a post and a chat but I have been doing lots of things that are kind of the same as always and have no novelty to offer you. But on the off chance you might miss me (well a little) I thought I would just write a diary post and spruce it up with some glamorous bread photos, shot at 9.30 yesterday morning when the sun deigned to pop out and do its thing. We also managed to get down to the beach and have a sunny dog walk before the mysterious twisty wind thing started up, so be assured we are making the best of this wild, wet and windy January. While I was eating the above, Brian was ransacking the loaf for sandwiches. It was a bread eating sort of a day. To the subject of cheese and lime pickle sandwiches. Lime pickle is a passion in this household. To be specific Patak’s lime pickle. It comes in at least two varieties, medium, which I can eat and hot, which I can’t. Brian smiles a wolfish smile when he eats the hot sort and says, with a little smirk, “What do you mean, it’s hot!” “Ha!” is what I say. Cheese and pickle (after bacon sandwiches with brown sauce) are his favourite, being a traditional sort of a chap – they make perfect picnic food for taking to the beach and eating in a stiff breeze while you watch scary dark clouds race towards you and people turning and marching briskly towards home. After a few bakes in tins, I have gone back to the bigger loaves for sandwiches and toast, because I think the crusts taste nicer when the whole of the outside of the loaf is exposed to the heat of the oven. Tinned bread, while servicable, and fitting better in the freezer always has a softer, even dare I say it, sweatier quality about it. If you have never tried a sesame crust to your loaf, you should give it a go just once. I have tried various ways to get the seeds onto the loaf and have reconciled myself to the simple truth that they will fly about a bit, but the end result is worth a little bit of sesame chaos. I roll the dough in the seeds, once I have shaped it but before the final prove. I don’t spray the loaf with anything first and make sure the sides of the ball of dough are coated in seeds too to allow for the rise of the loaf. 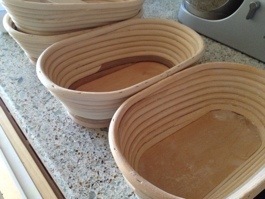 You can then either prove the loaf right side up or sesame seed side down in a floured cloth in a bowl or in a banetton. I buy large bags of sesame seed from Bristol Sweet Mart, worth looking for larger bags if you get a taste for something like this. This particular loaf was half the date kefir recipe to be found here but you could use a more traditional sourdough style bread like the Hamelman one pictured here, or indeed any bread recipe that you are confident with that uses a proportion of wholemeal (wholegrain USA) flour. I have also recently tried varying this recipe to use barley malt syrup, which is probably more readily available to people and you get a bread with that distinctive ‘English’ malted taste. I personally prefer the date syrup, but I am contrary that way. This loaf weighed around a kilo. I baked it hot at 220C for all of 50 minutes and didn’t turn the oven down at all. It developed a very dark rich crust and the crumb was perfectly baked. A complete joy of a loaf! So together with some good cheddar and Patak’s pickles life couldn’t be simpler or finer. We also made a second sandwich using the damson relish I made last autumn pictured above. I am increasingly making more relishes and chutneys and less jams. This one is good enough to eat on toast all by itself but I can’t remember which recipe I used. I think probably Pam Corbin’s one in Preserves. If you need an excuse to say hello (please say hello!) you could tell me what you like to put in your cheese sandwiches? Or have a quick moan about your weather… Misky tells me they had a twister in her part of Sussex yesterday. I wonder if we had a mini one in the garden. There was a strange moment when the sky went very dark and the wind blew one way across the garden and then the next minute it went the other way…. apparently we do get waterspouts in the Bristol Channel and there was one round this time last year. This entry was posted in Bread, Dog Walks, Sunday Chit-chat and tagged Bread, Burnham, cheese and lime pickle, chit-chat, Sunday on 26/01/2014 by Joanna. 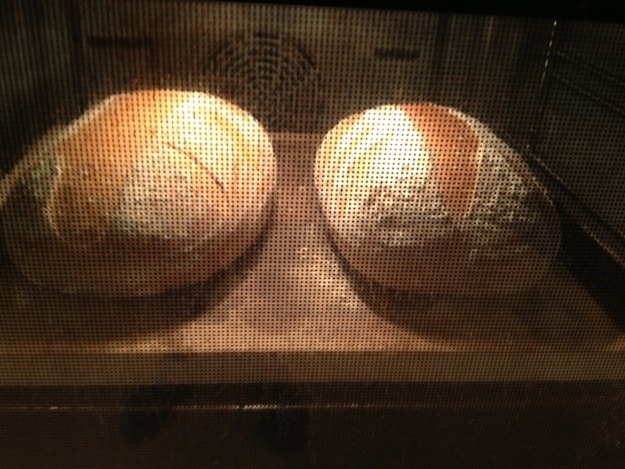 One of the many lovely bread blogs that I read is Brot & Bread written by Karin (Hanseata). I sometimes think that people who think and read most about bread (and end up baking it!) are people who have moved to another country and find to their surprise that the foods of their mother country are either non-existent or just different in some way that does not please. Bread seems to be one of those foods that starts this journey. I grew up with a mother who couldn’t cook but complained bitterly about how horrible English bread was, it is too wet she used to say, or it has no substance. In her last years when she was in a nursing home, my sister and I would be sent on food missions, to find European chocolates, usually one particular variety which could maybe be found at an airport shop, or for the ‘right’ bread. Often when the ‘right’ bread was found it was left out to air and dry a little until it had the right textural qualities that she wanted. It is a far cry from most people’s obsession with ‘fresh’ bread: wet and steamy, warm and squidgy, with that sweet and unique aroma – I can see its charms, but I tend to share my mother’s preference for the ‘right’ bread. It’s strange how these things work. I would have been so pleased to be able to take the ‘right’ bread to her, baked by me. So when I read Karin’s post about how hard it was to find the ‘right’ sort of rolls in the US, I had great sympathy and I was curious to make her rolls and see what she meant. Like all my good intentions, there has been some delay but I finally made these rolls with a good soft 00 flour with 10 g of protein per 100g which is about the softest I could find. I looked at a bag of plain (soft) flour from the supermarket yesterday and it had 11.4 g of protein, hardly a weak flour if that is what one goes by. I found this discussion of what 00 flour is matches my understanding best. There are a lot of other explanations of what it is on the net, some of which I am not exactly convinced by and some are just plain wrong. I am neither miller, nor grower, nor pro baker, so if you want to discuss this, I probably know as much,or less, than you, based on what I can read on the internet and from conversation with other bakers. When I had finished mixing and kneading the dough was very tacky, but after the four folds described it was fine. I tucked it away in the fridge overnight and made the rolls this morning. They could have been a tad more golden, I think I opened the oven to rotate the trays one too many times and lost heat, but they are delightful even so. The crumb is fine, soft and tender, without being wet or squidgy and I am very pleased to be able to add this to my white dough repertoire and to have a truly soft roll to be able to offer to people who want them. Thank you Karin! This entry was posted in Bakers, Bread and tagged 00 flour, baking, bread rolls, brotchen, food from home, hanseata blog, Karin, yeast on 23/11/2013 by Joanna.